You’re likely familiar with traditional video content production: marketers plan out their story, film it, format it for playback, then post it for fans and followers to view on demand. But there's a lot more to video these days, especially if you’re looking to get noticed by selfie-obsessed young audiences. Welcome to the new, more interactive, world of social content. Consumers are no longer just passively viewing your media, they’re commenting, co-creating, and sharing to communicate within their own social circles. How can your brand start a visual conversation that will get the attention of your target audience? For starters, take a look at two content formats that have become tremendously popular over the last couple of years: Peer-to-peer (P2P) messaging and livestreaming video. Peer-to-peer visual messaging: Visual communication platforms like Skype and Google Hangouts have been enabling video chats, webinars, and virtual events for years. But it wasn't until the rise of social networks like Instagram and Snapchat that brands began to invest serious time and money into creating visual-centric peer-to-peer conversations. Great for targeting young, mobile device-dependent audiences, P2P messaging is characterized by the combination of photos, videos and graphic overlays with the ability to caption, comment on, and deliver messages directly to fans, either via their social media news feeds or dedicated mobile apps. Livestreaming video: As the name indicates, livestreaming video is similar to other video streams, as well as to traditional broadcast media, like television. But instead of being filmed, produced, and aired as a scheduled viewing experience, this type of video content–popularized by apps like Periscope–is created and delivered in real-time, giving the content a greater sense of immediacy and context. 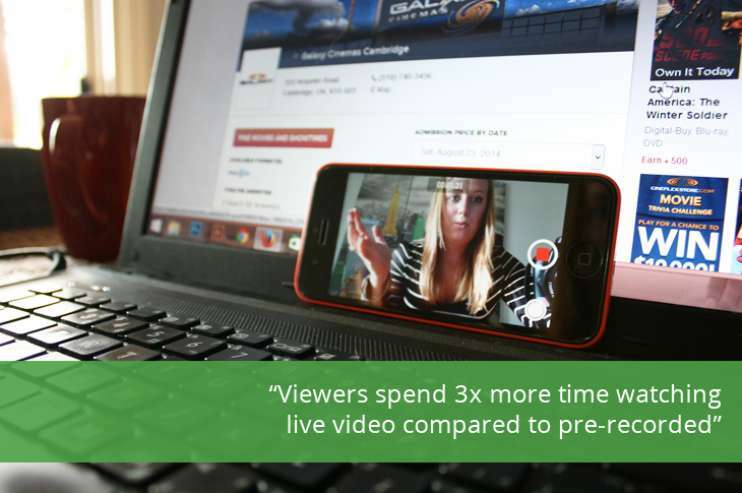 Not only are companies using this technique to create unique, spontaneous, and story-driven moments, they are helping bring fans and followers into the conversation, since livestreaming enables video creators to capture and respond to questions, comments, and other feedback throughout the entire live experience. Both formats are changing the way social networks deliver engagement to their business customers, as well. In less than two years, Facebook, Twitter, and Instagram have each launched or acquired enhanced video capabilities that help them keep pace with networks like Snapchat and Vine. According to Bold Content Video, viewers will spend 3x more time watching video that is live compared to pre-recorded video. Last week, Instagram doubled-down on video storytelling by offering a more Snapchat-like experience through Instagram Stories. Of course, it takes some extra skill, practice, and strategy to ensure your investment in streaming video will pay off. While your videos may naturally appear in your fans' social feeds, you'll reach a wider audience if you give your followers time to tune in. This will help you ensure that your events reach your target audience–even if they haven't yet added you to their feeds. Creating a rough outline or brief description of your story before you broadcast will help you avoid some performance anxiety. Authenticity is key; take care not to sound too polished and plastic. You can send them alerts when you have a new video ready to stream their way. By bringing viewers into the action, you will create a more meaningful and memorable experience. Don't be afraid to go back and forth between ideas – like creating humorous skits, polling your audience, conducting man-on-the-street interviews, or hosting in-depth discussions. A little variety will help encourage fans to tune in often so they don't miss out on something new and exciting. If you film in remote locations, make sure viewers' experience won't suffer from dropped connections or poor visual quality. Are you interested in creating a visual story for your brand that commands–and earns–attention from your audiences? Let's talk. The Prove team is professionally skilled in multiple areas of content and social marketing, with a strict focus on ROI and business growth. Our scalable solutions can be applied to any phase of your current marketing efforts, from strategy and concepting to video content production and distribution.